To hire and retain top talent in today’s ultra competitive job market, you need accurate salary data. As the economy recovers and the unemployment rate declines, job seekers can be more selective—which often means waiting for the right salary. Although benefits, career paths, cultural fit, vacation time and work-life balance still matter, salary remains the most important factor to job seekers. In fact, two thirds of the respondents in Workforce 2020, an Oxford Economics and SAP SE study, said compensation matters most. 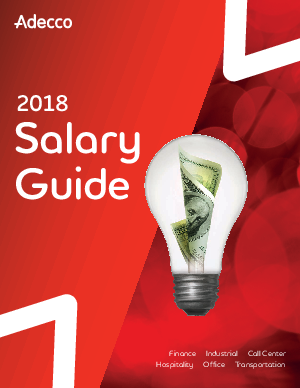 Our Salary Guide helps you have more informed salary discussions and put together competitive compensation packages—the key to hiring and retaining the best talent.